The Little League Softball® World Series in Portland, Ore., is never short on talented players. But it takes a lot of talented volunteers to bring the tournament to life. That’s where groundskeeper Mike Hebrard comes in. 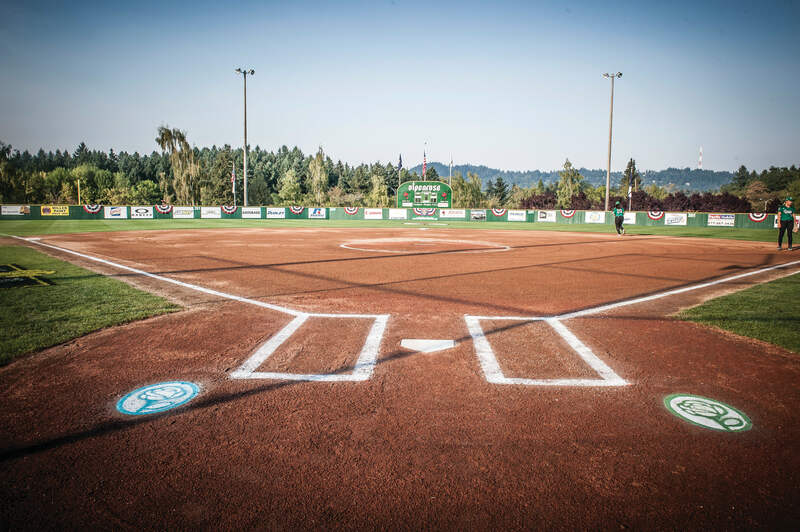 A native of Portland, Mr. Hebrard has been preparing the fields for the Little League Softball World Series since the tournament moved there in 1993. His work and dedication was even recognized by the Sports Turf Management Association in 2012 with Field of the Year honors in the softball category. But what those watching at home don’t know about Mr. Hebrard is that the Little League Softball World Series, while it might be his favorite, is just one in a long list of well-known sporting events that even includes “the granddaddy of them all,” the Rose Bowl. Mr. Hebrard, who has his own business painting logos for special events and consulting on field preparations, has been working on the fields at Alpenrose since before the Little League Softball World Series came to town. The rest, as they say, is history. When the Little League Softball World Series moved to Alpenrose Dairy in 1993, Mr. Hebrard became the volunteer groundskeeper. He has overseen various crews of volunteers over the years including his current staff. “I have two high-school kids, a local golf course’s superintendent, and my son, Andy, who help me,” said Mr. Hebrard. Together, they skin the infield – which means pulling up the grass just days before first pitch. They also cut the grass, paint the lines, and just generally prep the field before, during, and after the event which takes place each August. 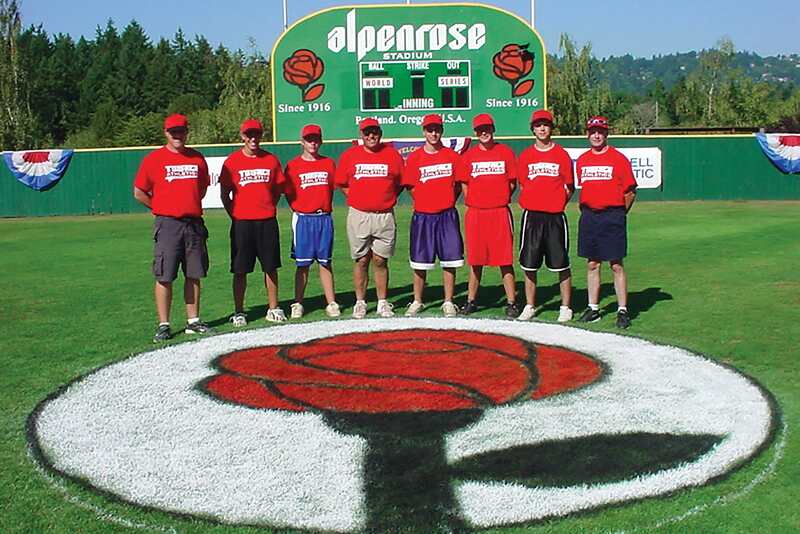 Mr. Hebrard paints an Alpenrose logo on each side of the batter’s box in a color that corresponds with that team. But the creative touches don’t stop there. When they started playing the Little League Softball World Series on a dirt infield, he added colored designs there as well. The designs can be seen on the ESPN broadcasts and have included everything from checkerboards to the word “Challenger” which was laid down during the Challenger Division Exhibition game. Mr. Hebrard may be known in Little League circles for his work at Alpenrose, but it’s hardly the biggest field or event he’s worked on. This past winter, he was on hand at the 2018 Rose Bowl where he helped paint the signature roses. So how did he manage to work at the Rose Bowl? Via text message. 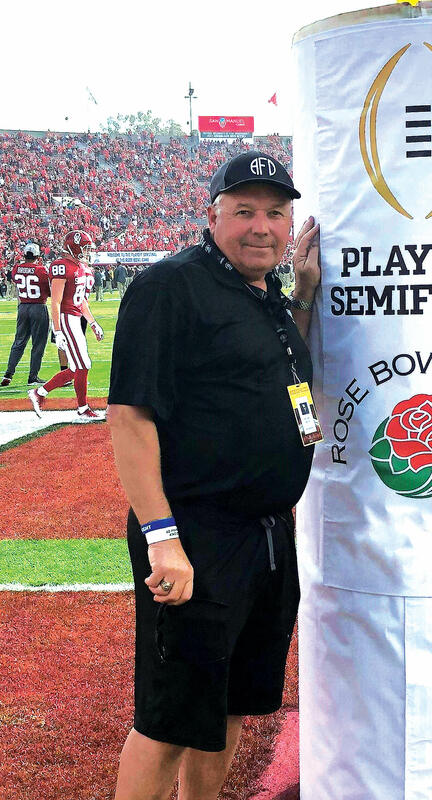 At an annual conference in Denver, the Rose Bowl’s head groundskeeper mentioned to a small group that they could use some extra hands for the set-up. Mr. Hebrard raised his hand. And while he’s had some amazing experiences at every level of sports, for Mr. Hebrard and his crew, it’s about making the girls playing in the Little League Softball World Series feel like they’re truly playing a World Series. And, for 25 years, that’s just want they’ve been doing.